Initially Henry the Young King was to be dubbed by his father-in-law, Louis VII of France, but chose to ask his most faithful companion and tutor in arms, William Marshal to lead him into manhood. It is worth to mention the events that preceded the ceremony. Young Henry had quarreled with his father over his status of the co-king of England. He had been crowned king in 1170, becoming also co-duke of Normandy and co-count of Anjou, all empty titles as time was to show. When his father kept refusing to share power and responsibility with his eldest son, the youth kept growing restless and impatient. What became the proverbial last straw happened in the opening months of 1173. Henry the Young King had been summoned to Auvergne by his father to take part in the meeting with Humbert, Count of Maurienne at Montferrand-le-Fort on 2 February. The conference had been held to discuss the marriage of Prince John and Humbert’s daughter. The Count had asked about John’s share in Henry II’s domains. The King suggested the three castles: Chinon, Mirebeau and Loudun as John’s dower, all situated in Anjou, a county assigned to his eldest son. Despite Henry the Young King’s loud protests and refusal to accept the terms introduced by his father, the settlement had been reached. To add insult to injury, the old king had dismissed several of the Young King’s intimates who seemed to be exerting a bad influence on him. In consequence, Hasculf de St Hilary and other young knights were forced to leave the Young King’s court. In the aftermath of the events described above, young Henry’s situation had even worsened. He had been held under house arrest. No wonder that the young man had used the first opportunity to escape and seek refuge at his father-in-law’s court . He had been followed by his two younger brothers, Richard and Geoffrey and backed up by his mother, Eleanor of Aquitaine, Louis VII of France, William I of Scotland, Counts of Flanders, Boulogne and Blois, as well as rebels in Poitou, Normandy and England. 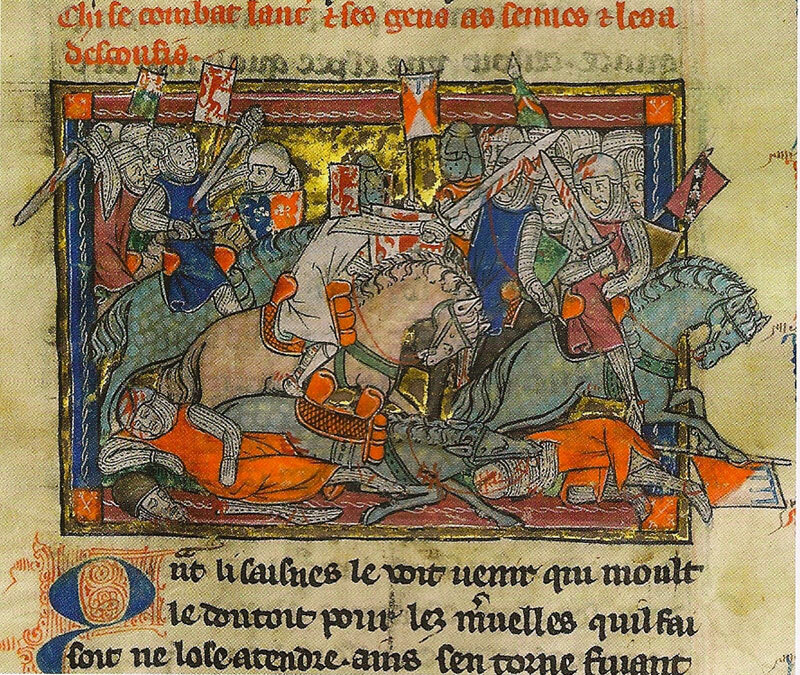 It was during Henry's escape, shortly after he crossed the French border on 8 March 1173, when his father-in-law’s barons led by Louis’s brother Pierre, lord of Courtenay, and Renaud, count of Clermont-en-Beauvaisis reached him to confer upon the young man the arms of knighthood. Louis thought it of highest importance to establish Henry’s full majority before the barons could swear their allegiance to him as the leader of the rebellion against the king of England. Why was Louis so eager to arrange the thing? As Henry II’s overlord and traditional rival, he was trying to do his best to encourage his son-in-law to assert his rights as co-ruler and thus undermine Henry II’s position. With all probability he had meant his brother, Pierre, to perform the ceremony in his name, but it never came to this, for young Henry chose to be dubbed by William Marshal instead. We can only assume that Henry’s chief reason for doing so was to avoid becoming even more dependent on his father-in-law. However, the History of William Marshal, which gives a detailed account of the event, makes it clear that Henry had chosen at the last minute ‘the best knight who had ever been or will be’ to belt him with the sword of knighthood. Although usually a young nobleman was knighted by a king, the Young King’s case showed that knightly prowess and qualities sufficed to bestow such honour upon a modest knight of humble origin, the one as William Marshal himself. That it why it was honourable for Henry to be dubbed by the ‘best knight’. William considered himself even more honoured by the appointment, which the History clearly states. In his own words: ‘God has here done great honour to Li Mareschal this day, for in the sight of counts, of barons, and of men of such high names, he has belted the sword to the king of England’. After he kissed his Young Lord and Henry became a knight, William’s own prestige in Henry’s household and among the knights was increased. We do not know whether Henry’s grandfather received colee- normally meaning ‘embrace’ but, quite contrary, in this period always meaning ‘blow’- or a kiss. ‘The blow and kiss were regarded as alternative rites, either of which could be employed to equal effect to conclude a knighting ceremony’. Still, we do know that Henry himself received a kissed from William Marshal. Usually the solemn ceremony was followed by the exuberant celebration. Remaining of the day was utterly devoted to the military games and ‘to attending to the glory of the body’. Did Henry the Young King and his guests have a chance to celebrate the same way as all those present at Rouen in 1128? I cannot tell. Perhaps they did, wanting to forget for a while the strenuous tempo of the past weeks and the dangers they were exposed to. Hasty it might have been still the ceremony let the Young King receive the oaths of support against his father from the French magnates present at the council assembled by Louis VII at St. Denis shortly after 8 March 1173. History of Duke Geoffrey by John of Marmoutier in The Plantagenet Chronicles edited by Dr. Elizabeth Hallam. Greenwich Editions, 2002. “Classic Knigthood as Nobility Dignity: the Knighting of Counts and Kings’ Sons in England, 1066-1272” by D’A.J.D. Boulton in Medieval Knighthood V ed. by Stephen Church and Ruth Harvey. Google Books. Meade, Marion. Eleanor of Aquitaine. Pheonix Press Paperback, 2002. Barber, Richard. Henry Plantagenet. The Boydell Press, 2001. Kasia, thank you for this great post. I find your posts can stir emotion quite easily. If I had the choice to attend a crowning or a knighting, I would choose the knighting. I love the significance of the ritual, the coming of age, rooted in all our mythologies. The above comment was posted by Joan. Thank you Joan! If I were to choose I would also choose the knighting :-) and the celebrations that followed. It must have been a joyous occasion indeed! Thank you for paying a visit to our Lesser Land! Another great post, Kasia! Knighting ceremonies have captured my imagination since I read about the future Edward II's utterly splendid one in 1306. Loved this bit: "at the time of his knighting Henry was in the midst of a war campaign against his father." Powerful! Thank you, Kathryn! I must read about Edward's knighting one day :-) I'm curious whether the ritual underwent any changes since Henry's knighting in 1173. Probably it became even more elaborate :-) Again, thank you for your interest and kind words. It does sound strange that Henry was knighted when at war with his father! And yes, I agree about knighting ceremonies are very interesting. Anerje, he badly needed to be lead into manhood before he actually became the head of the coalition against his father. Without knighting ceremony nobody would have treated him seriously and- as I have mentioned in the text- he wouldn't have received the oaths of fealty from the barons.